Papercrafts by Patti: Birthday or Wedding Stitches? I had so much fun creating this card. It's so pretty! I love the colors and the stamp font and those lovely stitches! What do you think? Would you use this for a wedding card or a birthday card? You are looking at the Stitched Labels Framelits and the Stitched All Around stamp sentiment and border design. I couldn't help finishing with pearls and Whisper White 1/8" ribbon. That tear in the Coastal Cabana frame shows off one of the framelits that makes a stitched pattern for you to use as a background. Thanks for stopping by today. I hope you will "vote" in my comment section and let me know what you would use this lovely card for. 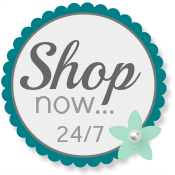 Use my Online Store any time you wish to purchase Stamping' Up! products.